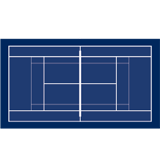 The USTA Adult 40 & Over league offers men's and women's NTRP levels 3.0 - 4.5+. In the 4.5+ level, teams will be allowed to have three 5.0 players on their roster. Only two of those players can play in each team match and must play in the #1 singles or #1 doubles position. See USTA National League Regulation 2.01A. Teams can advance as far as Nationals in this league. The format for this league is men's and women's NTRP levels 3.0 - 4.5+. The format for this league is two (2) singles and three (3) doubles matches per team match. The minimum roster requirement is 8 players. Players must be at least 40 years old as of December 31 during the year of competition to be eligible to participate. The exact number of matches depends on how many teams are in each flight, but teams will generally receive 6-7 weeks of matches. Dates & Deadlines. USTA Colorado's League fee is $24.00 plus the Active.com Processing Fee.